Ah, that reminds me. One thing I saw a couple of times in Berlin (but not, sadly, when I had my camera to hand) was cycling pubs. 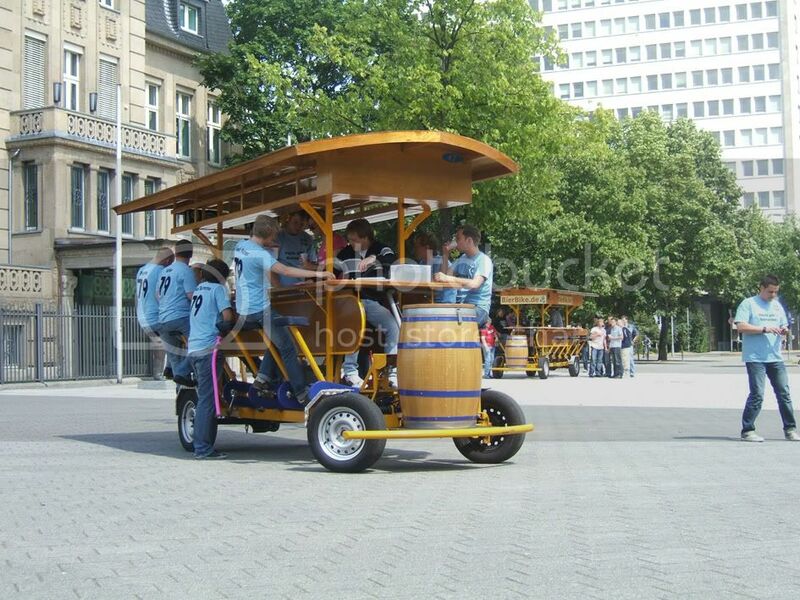 That is, some kind of covered float with a bar on it, where the customers sat facing the bar and pedalled while they drank, with a (presumably sober) staff member steering at the front. I'm guessing it was some kind of novelty service available for stag parties and the like. Wish I'd caught it on camera. I've seen one in London going along Upper Ground behind the National Theatre. They seem quite popular for stag-dos. I saw the tandemming commuters again today, and felt very jealous. I finally got to see what brand of bike it is. It's a John Fern, but I'm none the wiser for that. Pino and Trets not in my exhaustive German dictionary although they might be Umgangssprache. Google Translate isn't a lot better assuming that they're German, but if you tell it to translate from Latin, it reckons that Trets is "Shall go through", which is interesting, and not entirely implausible. It still doesn't help with Pino however. It also suggests "Features" for Trets, if it's in Catalan, but that sounds less likely. All from Google Translate, so make of that what you will! Well I always assumed there was some animal link because of Hase and Lepus so it's not just you! A 1908 Centaur, with interesting double-stays and acetylene lamps. Still ridden on a regular basis - I was able to speak to the owner. Is that one of those city bikes with the built in lights? What's it like as a bike (i.e. to ride etc)? Except that being a two wheeler recumbent trailerbike, it should more propery be "Shall go through unless it's a Sustrans path with bloody anti-motorbike gates". i saw one of those in the new bike shop in cambridge - unbelivably ugly!! It looked like it had a built in lock between the top tube and down tube, but that doesnt seem to have it.. 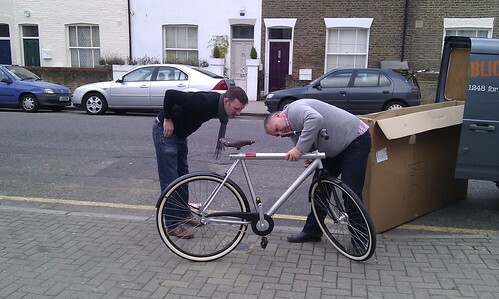 It's a Van Moof no. 3, yes. Coaster brakes, 3 speed hub gear, integrated solar powered lights, 28 inch wheels. Mike, the one with the built-in lock is the no. 5, which truly is even uglier because of the extra tube to house the Abus chain. The ride is actually very good; the frame is light, which combines with the huge wheels to make it easy to control and speedier than you would think. Dorky it may look, but it is fun to ride. Mrs Torslanda, of the horned helmet and heavy metal breastplate, has just branded them thus: not bicycles, just pieces of tube welded together. Possibly the most expensive BSOs on sale . . . I missed seeing a Pedersen this morning, which ChrisL had spotted. On the other hand, riding with the group on Saturday round the (cold) art deco delights of West London, we had, inter alia, a smart 1938 Rudge roadster, with deep mudguards, a nice Perry, an old skool Spesh Hard Rock and some others which I will recall eventually. A rather nice looking Harry Quinn just missed me running into me on College Green. 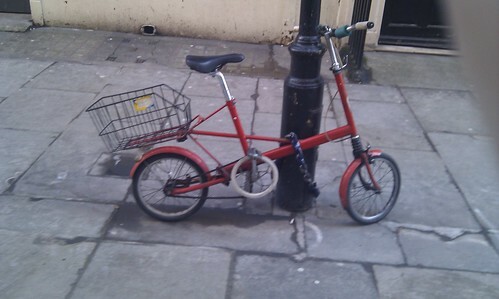 Spotted a vintage Moulton "New Look" Standard on Meard Street, today. Oh, I see I also spotted my thumb. itsbruce, that looks very small to me. It was a dinky little bike, yes. It is a Moulton Mini with 14" wheels, rather than the 16" wheels of the other F-frames.